Try to buy good quality scissors that your budget will allow, as the cheaper alternative’s tend to blunt quite quickly. Preferably self-healing matt, so that you do not end up with countless gouges and indentations, which can affect the edge of a cut and can lead to a dulled craft knife. These mats will also last much longer. Personally I prefer the Friskars finger tip craft knife to give me greater precision, but of course a normal craft knife would suffice, so long as it’s very sharp. I would suggest a hard pencil preferably in the H range, so you can make light marks on your cards and easily erase them without leaving any markings. I personally prefer a putty rubber that can be used to remove all sorts of markings. It does not leave behind any rubber residue and can be shaped by hand for precision erasing. 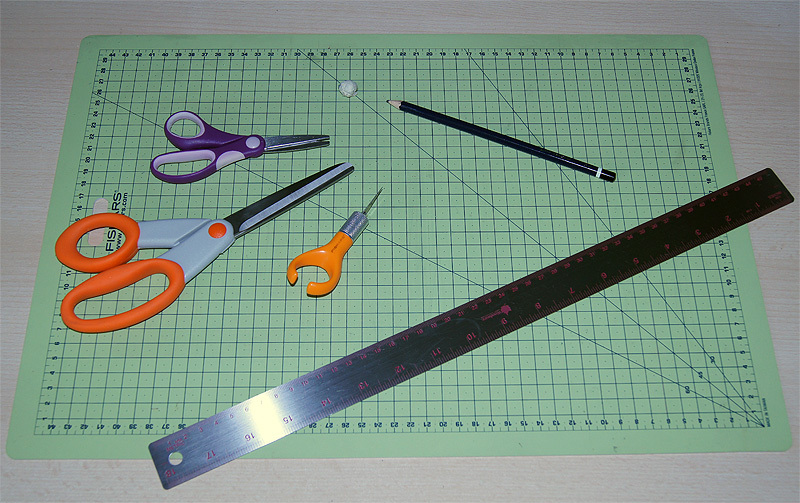 There is nothing worse when trying to cut a straight line when your ruler slips out of position or when your cutting knife takes a gouge out of your rulers edge. These should be the core basics of your crafting tool kit. As you develop your craft skills your toolbox will begin to fill up with a whole range of extremely useful crafting tools for different techniques. You don’t have to spend a fortune on equipment from the outset, but I would say don’t skimp on scissors or your craft blade, get the best that your budget will allow. Once I have an idea on what I want to create, I then investigate which would be the best tools to buy and techniques to use to create the end result. I hope this short guide helps those new to card making, have fun crafting! This entry was posted in Card Crafting Tips and tagged basic tool kit, new to crafting, tips, crafting, crafters on May 28, 2011 by Sherrie. Great article! Really helpful. Keep it up. Great article! Keep it up.